Femme de Joie was cheered when she heard that Chef Jeff Cerasaro was slated to open up shop again in the old Fiesta Azteca spot on Park Marina Drive (long-time residents will remember that as the old Jolly King when The Knight's Inn first opened in the late 1960s; since then a series of restaurants has come and gone). Say what you will about Chef Jeff - and M. de Joie has heard a lot of opinions about the man himself - he knows how to cook. After three visits to Tortuga, Femme de Joie can safely say without fear of contradiction that she has absolutely no idea who's in charge or what's going on in the kitchen; it just gets confuseder and confuseder. On her first visit, M. de Joie arrived at 12:30 PM. There were 2 booths occupied. It took four minutes to connect with someone to seat her and another ten before her order was taken. The prices on the menu were reasonable but the menu seemed to be overextended in offerings. There were some standard coffee shop staples, plus some old Pio Loco standards like smoked salmon dressing and pork naranja; they served breakfast, lunch, and dinner. 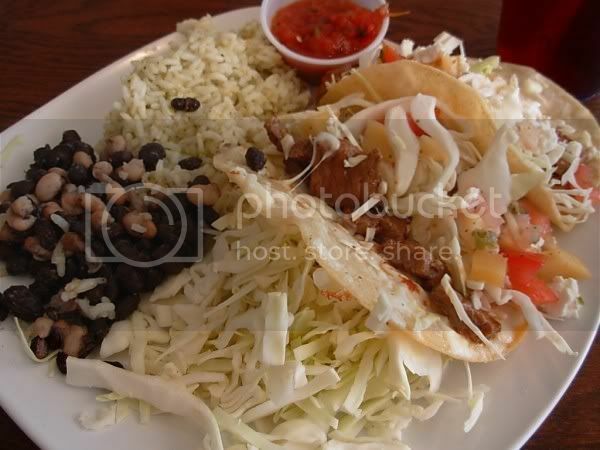 When M. de Joie ordered steak tacos, the waitress asked, “Do you want, uh, the beans and stuff?” At 1:00 the waitress came back with a report that it would just be a minute. Ten minutes later she came back and reported there had been a mix-up, something about an order of fish tacos being taken by “her girl” and they were making the steak tacos right now. A few minutes later the food actually arrived with steak tacos, beans and stuff. The tacos had chunks of steak that were juicy and flavorful. The mango salsa was mostly mangoes with no other flavors. The beans were completely tasteless; the rice had a slight tartness that may have been from a tomatillo salsa. There was a pile of plain shredded white cabbage which seemed to have no purpose except to fill out that edge of the plate. A glass of sweetened iced tea was very sweet indeed. On her second visit, M. de Joie was seated promptly. There were five full tables and a crowd at the bar, so this was an improvement. But the menu had been completely overhauled and it looked like all traces of Chef Jeff had been scrubbed away. It was a very ordinary diner menu - club sandwiches, burgers, salads, with nary a taco in sight. 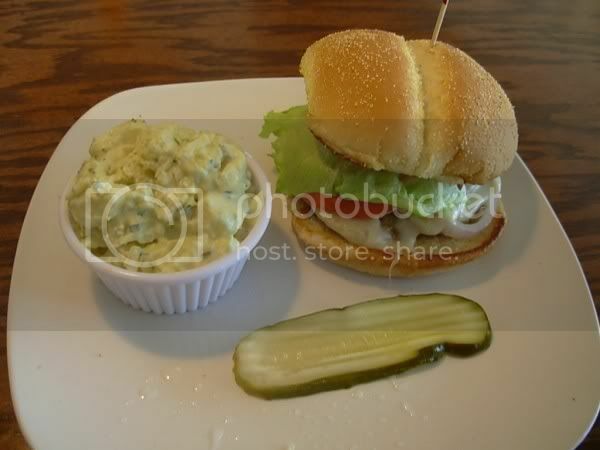 Turkey burger with potato salad. The turkey burger was cooked all the way through - appropriate when dealing with poultry - but the only seasoning was a pinch of salt, so the sandwich was very bland. The potatoes in the salad were a bit crisp; the dressing was undistinguished. Overall, the meal reminded M. de Joie of the diet one might get in the hospital when recovering from surgery. There was yet another menu set before her when M. de Joie made her third visit, a combination of the first two: Diner delights meets quasi-Mexican. 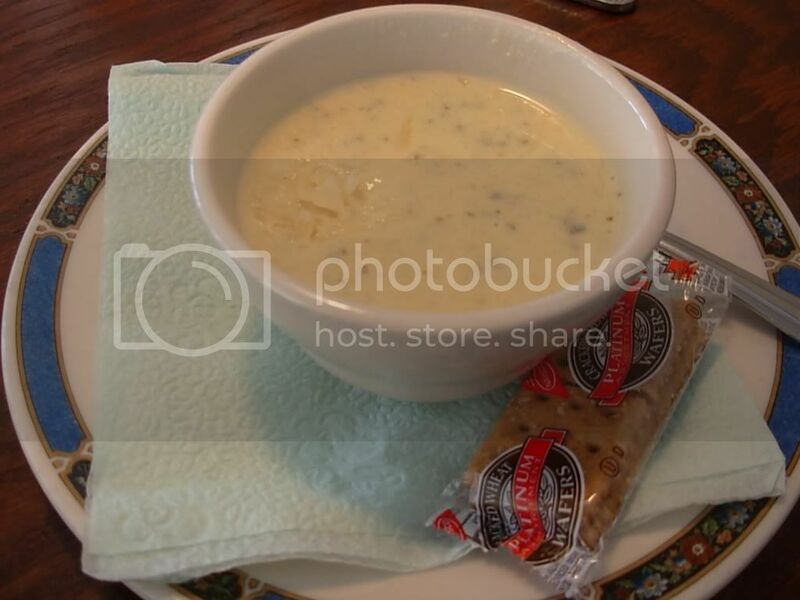 A cup of creamy broccoli soup was really quite delicious, thin but creamy with a mild broccoli flavor. There was an odd little clump of semi-melted cheese bobbing on top. 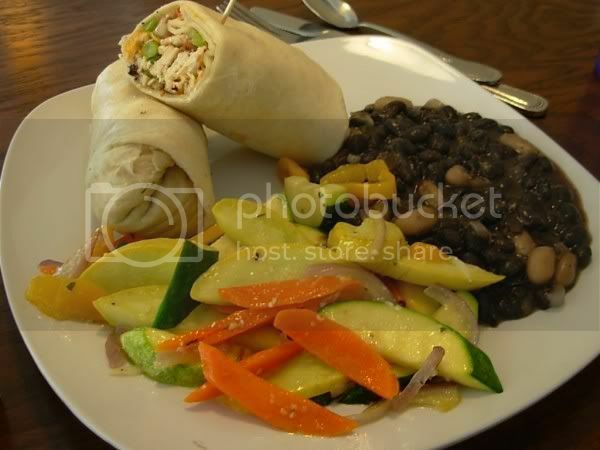 The Tortuga Tortilla Special was a wrap with grilled chicken, asparagus, Cheddar cheese and pico de gallo, seved with black and white beans and grilled vegetables. This should have been wonderful but was a huge disappointment all the way around. On her first bite, M. de Joie noticed a weird bitter taste that turned out to be very old, tough stringy asparagus. Nothing could cover up that unpleasantness, not the chicken, the not-quite melted cheese, or the bland pico de gallo. The rest of the plate was no better - the black and white beans were cool-to-lukewarm and the grilled fresh vegetables (squash, carrots, yellow bell peppers), while perfectly cooked, sat in an enormous puddle of oil that rapidly seeped out toward the rest of the plate. Later that evening, Femme de Joie was still acutely aware of that virtually inedible lunch. What's going on at Tortuga Bay Grill? It's a bright and pleasant space that could be home to a spiffy retro-lounge diner, but while the service has improved, the kitchen has lost its way and gotten into trouble. M. de Joie hopes that someone can step into the lead here and improve the food and execution. edit: Tortuga Grill is now closed. Tortuga Bay Grill, 1815 Park Marina Drive, Redding, CA, 229-0755. Open for breakfast (Saturday-Sunday only), lunch, and dinner. Beer and wine. Credit cards. On-site parking. Vegetarian and vegan options. Website at Tortuga Bay Grill.